What if you could have a law job that let you wear pajamas at noon, take extended trips to visit family and friends, and burn the midnight oil because that is when a great idea hits you? If that strikes a chord for you, then don’t even finish reading this post. 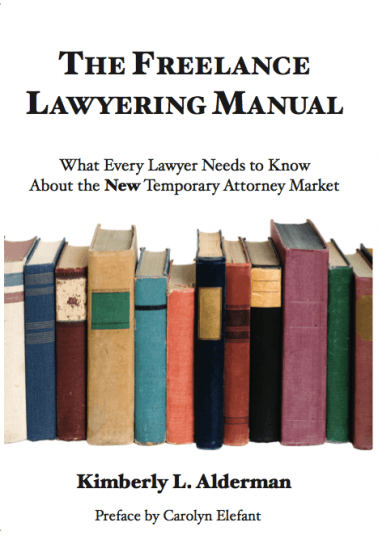 Just head over and buy your own copy of The Freelance Lawyering Manual: What Every Lawyer Needs to Know About the New Temporary Attorney Market, by Kimberly L. Alderman. If you wonder what qualifies Alderman to write this book, consider this: She built a successful freelance lawyering practice from the wilds of Alaska, with nary a lawyer, police officer or courthouse within hours of her. After completing a judicial clerkship in the U.S. Virgin Islands (where I once met her while giving a CLE presentation), she moved to Alaska to pursue her dream of remote living. “Freelance was the only way I could continue practicing law,” she writes. If she was able to do it from there, she can probably help you do it from wherever you are. works from her own office. 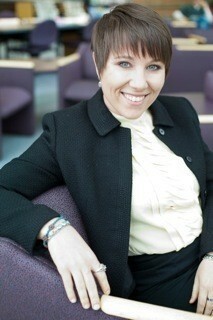 She rustles up her own assignments and invoices her attorney clients directly. Freelance lawyers are, in every sense, independent contractors and small business owners. The first freelance lawyers were stay-at-home parents, attorneys in-between jobs, and semi-retired older practitioners, Alderman writes. In the last decade, however, the freelance lawyering market has changed dramatically. Even as the economy has driven many lawyers out of full-time jobs and into freelance lawyering, all 50 state bars and the ABA have now addressed the ethics of using freelance lawyers. Alderman does not sugarcoat freelance lawyering. While she clearly enjoys the freedom it gives her from workaday drudgery, she cautions that it takes time — possibly years — to build a profitable freelance practice. You need to be self-motivated and happy working on your own. Getting lawyers to hire you will often be a hard sell and, when they do hire you, you may not get the types of matters that most interest you. But if you are ready to take the plunge into freelance lawyering, Alderman’s 293-page book walks you step-by-step through how to do it. She gets into the nuts-and-bolts here, talking about which legal-research services to use, how to set your rates and bill your work, how to market a freelance practice, what form of agreement to use when you’re hired, and even how to manage your files. There is also a section of the book directed to lawyers who may be thinking about outsourcing work to a freelancer. It covers topics such as why outsource, how to find the right freelancer, and how to address it with clients. The final section of the book is devoted to the ethics of freelance lawyering. It covers supervision of freelance lawyers, confidentiality, malpractice concerns, screening for conflicts and billing for freelance services. Appendices include key ABA ethics opinions on freelance lawyering and a state-by-state summary of state ethics opinions. The book’s preface is written by Carolyn Elefant, who, as founder of MyShingle.com and author of the book Solo by Choice, has demonstrated that she knows a thing or two about building a law practice. Both she and Alderman point out that, even as freelance lawyering has gained greater traction, there has been no comprehensive guide to assist freelance lawyers or hiring lawyers in understanding the practical and ethical issues involved. Kimberly Alderman’s book not only fills that void, but does so comprehensively and intelligently. An added bonus is that Alderman is a darn good writer. Here is that rare legal practice guide that is actually a pleasure to read. Whether you are actually starting a freelance lawyering practice or merely daydreaming about it, you should buy this book. You can get the book for $45 through either Amazon or Barnes & Noble. While you’re at it, check out Cultural Property & Archaeology Law News, the fascinating blog written by Alderman, who has now left the wilds of Alaska for the wilds of Wisconsin, where she is an assistant clinical professor at the University of Wisconsin Law School.